Like most cities, Rochester has produced its fair share of professional athletes. Abby Wambach, the two-time Olympic gold medalist and FIFA Women’s World Cup champion, grew up in Pittsford and was a star soccer player at Our Lady of Mercy High School. Walter Hagen, a 11-time championship professional golfer from decades past, developed his game at the Country Club of Rochester. The next star athlete from this area set to make history is hockey player by the name of Brian Gionta. Having already represented the U.S. in the 2006 Winter Olympic Games, this year he will serve as captain of U.S. Men’s Hockey team at the Games in PyeongChang, South Korea. Born and raised in the suburb of Greece, Gionta attended high school at the Aquinas Institute in Rochester and was named their Rookie of the Year in 1994. He then went on to play for Boston College from 1997 to 2000. During his time on the team he was mentored by another Rochester native, Marty Reasoner. Following college hockey, Gionta went on to play for several professional teams, namely the New Jersey Devils, the Montreal Canadiens and the Buffalo Sabres. He served as team captain for both the Canadiens and the Sabres. Since October of 2017, Gionta has been a part of the practice squad for the Rochester Americans. This not only has helped him prepare for the Games, but may lead to a position on the team: the game against the Toronto Marlies Friday, Feb. 2 was part of his one-game professional tryout contract. Jade Mancini, a second year Criminal Justice major and forward for the RIT women’s hockey team, is excited to watch Gionta perform in this Olympics. “Brian Gionta has a great opportunity to play with the USA national team after opting out of the NHL this year. He’s a natural leader and will bring great experience to the team,” said Mancini. Another RIT hockey player, third year New Media Marketing major Mark Logan who plays left wing for the men's team, is also eager to see how Gionta and his team will perform in the games. 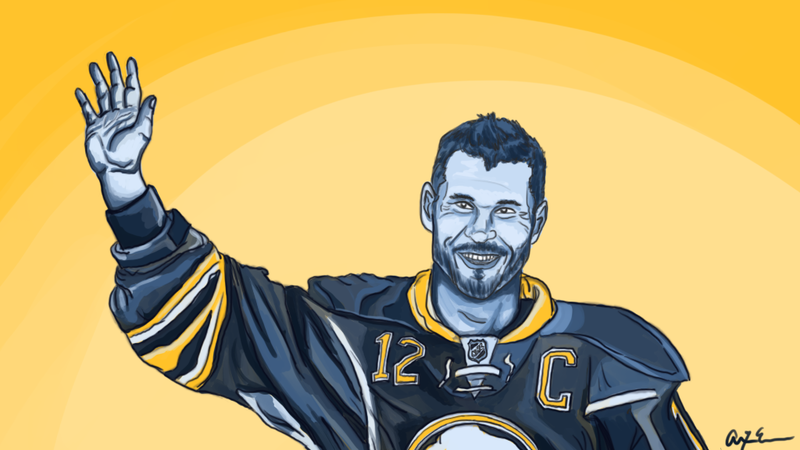 "I think it's pretty amazing to have Gionta as the captain ... He is a very good leader and I know it will be special for people here in Rochester because he is looked up to in the community." According to Logan, Gionta has even visited the rinks at RIT. "He trains at RIT over the summer months so I know some of the guys have had the chance to get to know him and they say he has tremendous work ethics and attention to detail." Both students and locals alike are clearly excited to have someone representing Rochester in this year's Winter Olympics. This years’ Games kicked off on Feb. 9 and will take place in PyeongChang, South Korea until Feb. 25. This is the first time South Korea has hosted the Winter Games; in 1988 the Summer Games were hosted in Seoul. There will be 102 events in 15 sports and a total of 92 teams are expected to compete. The U.S. Men’s hockey team entered into competition on Feb. 14 at the Kwandong Hockey Center and the Gangneung Hockey Centre in the PyeongChang Coastal Cluster against Slovenia. Although the U.S. ultimately fell to their opponents in a close 3-2 game, there were a lot of moments to be excited about. Gionta and his team took on Slovakia next on Thursday, Feb. 15, and were able to get right back on track with a 2-1 win. Catch the team in action as they challenge Russia this Saturday, Feb. 17 at 7:10 a.m. EST. Movie Review: "The Shape of Water"